﻿ MCN Fleet: Two-up on a 250 - how hard can it be? MCN Fleet: Two-up on a 250 - how hard can it be? Taking a passenger on the Suzuki GSX250R is something I have wanted to do since I got this bike. I almost always seem to ride solo and I often wonder what my rides would be like taking someone along to share the experience. Despite riding on the road for around five years, the Suzuki GSX250R is the first bike I have ever had with a rear seat and pillion pegs. In order to finally satisfy my curiosity, I roped in the services of my 16-year-old brother. He had never been on the back of a bike and only had limited experience riding under his own steam. Though slightly taller than myself at around 5ft 10in, his lightweight string bean frame meant the 250’s 248cc parallel twin, 24.7bhp motor didn’t have to work too hard to carry us both at fast road-legal speeds along the back roads of Lincolnshire. Though acceleration is reduced, the bike will still keep up with the traffic and, once up to speed, offers enough poke to inspire overtakes. Though the engine was surprisingly up to the job, it soon became apparent that the extra weight from my pillion made the 250 a challenge in the bends. The bike feels wallowy and vague. On standard settings, the rear shock is too softly sprung for the extra weight, which causes the whole rear end to bounce over every bump. Away from the countryside though, the bike is perfectly well behaved. Combined with its feather-light clutch and now even lower seat height, the bike inspires you with the confidence to filter through traffic and carry out low-speed manoeuvres like U-turns, with your passenger still mounted. The engine is also still spritely enough to nip into disappearing gaps between the traffic without too much fuss. 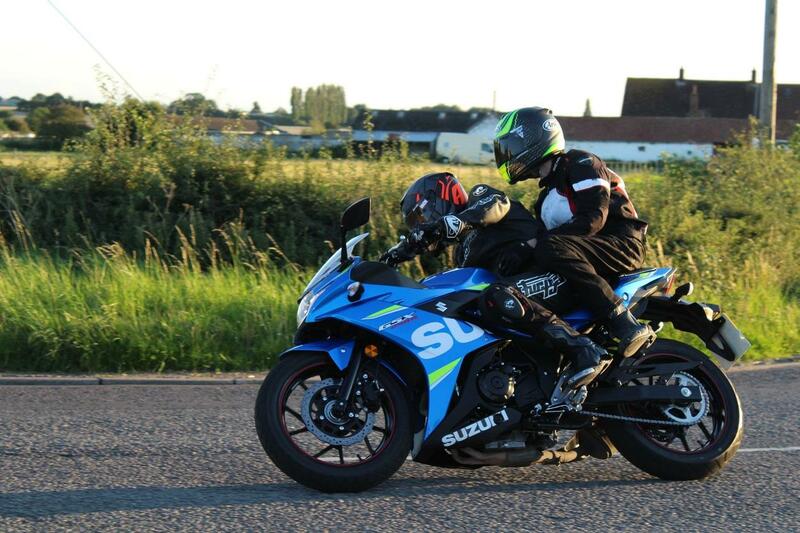 In short, the Suzuki GSX250R can take a pillion, however I am not sure I would want to make a habit of it. It’s fine around town, but anywhere else I’d want a bigger engine and firmer springs for an added sense of stability.